Shaktipat Intensive Schedule. Sadguru Kedarji's Shaktipat Blessing. Shaktipat Intensive Schedule. You can attend weekend Shaktipat Meditation retreats led by Sadguru Kedarji. Kedarji is a Shaktipat Guru in a long lineage of Sadgurus. Our staff certified program leaders assist Kedarji in these events. Have you every had the thought, “Is this busy life all there Is?” This world is a busy place. So full of excess stimulation and perceived instant gratification. However, you are so much greater than that. You are so much greater than you think you are! 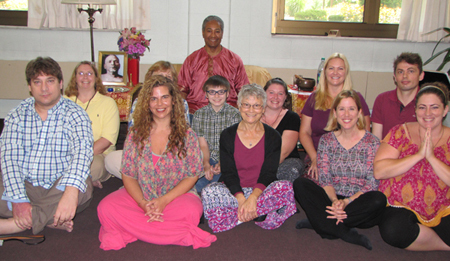 Awake to The Supreme Intelligence with our weekend Shaktipat intensives! The Power of Solitude, Silence & Chanting! May 10-12, 2019. Youngstown, OH. August 9-11, 2019. Youngstown, OH. The Shaktipat Blessing begins with The Maharudra Awakening. This is our proprietary, 15-minute process that is also taught as a daily spiritual practice. In addition, The Maharudra Awakening prepares your entire being for the receipt of the Shaktipat Blessing, while invoking healing. This profound initiation catapults you into the practice of Shaktipat Meditation and the experience of living in a state of Grace. Therefore, it is the greatest, lasting gift one can receive. This transmission of Grace reveals who we really are and catapults seekers of the Truth into a life of dynamic spiritual transformation. The following are airports within a reasonable driving distance to Nileshwar Shaktipat Meditation, Wellness & Spiritual Retreat Center in Ohio. In most cases, connecting flights to local airports are available, as well. You will learn Spiritual Practices That You Can Easily Apply In Your Home or Office. Learn , Our Proprietary Approach To Meditating That Makes The Mind Quiet In Under 3 Minutes. Experience Chanting and Meditation With a Deep Connection to the Divine. You will learn Principles of Shaivism and The Yoga of The Siddhas. You will learn Breathing Techniques to Quiet the Mind (Pranayams). Experience Mantra Initiation and learn Mantra Yoga. **The Shaktipat Blessing intensive is also a means for seasoned students and experienced meditators to accelerate their spiritual development and practice. These weekend awakening retreats are held in small groups in a quiet setting.